This one continues to be quite a work in progress and has me doing a couple of things I’ve never done before: 1) machine applique and 2) learn and apply new techniques “as I go”. I like to take the time to practice and perfect a technique before incorporating it into an item I intend to give as a gift. This way the entire process runs smoothly, and the product turns out the way I had envisioned. When I find myself with frequent thoughts of, “Am I doing this right?” or “How am I going to fix this?” I can become so overwhelmed with the unfamiliar details that instead of enjoying myself I go into a, “just get it finished” mode. Along with that frame of mind is the inevitable – something will go wrong and often so wrong it can’t be righted without a complete do-over. With this quilt I find myself in a different frame of mind – I’m not worried at all about the process or the outcome. I’ve taken a leap of faith and decided fretting and worrying about doing everything perfect is not worth it. This quilt is for the baby whose mother is a friend and co-worker – what’s the worst that could happen if it doesn’t turn out completely perfect?!? hand sewn onto a larger piece of fabric and the applique was only one layer. I’ve seen similar quilts that incorporated various styles of applique and immediately fell in love with each one and have always wanted to use this pattern for a baby quilt but didn’t have a good enough reason until now! And as much as I love to piece quilt tops, I’m having so much fun putting together these applique designs I almost dread the day when I have them finished and I must move on to the next step – piecing the rest of the quilt top. 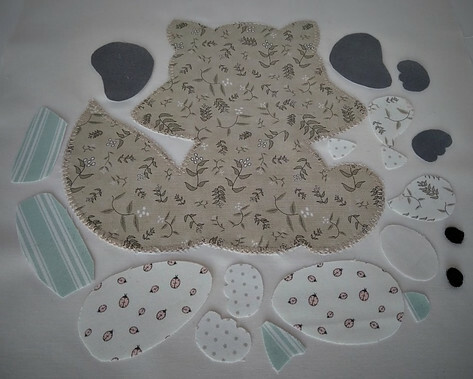 Each applique pattern for this project has separate pieces (some more than others) and many of those pieces are layered. Lots of cutting, fusing, sewing and changing colors of thread on the machine but, just like a baby that requires a lot of care and attention, they are so darn cute you don’t mind the extra effort at all! The minute I laid my eyes on this soft, sweet, dreamy fabric from the line called Hushabye Hollow by Lydia Nelson for Moda fabrics I knew this was the one! The quilt I’m making is for a baby boy so from this fat quarter bundle I chose fabrics in the colors you see below: green, yellow, ivory and taupe. You could use this same color combination if you are wanting something that is gender neutral. This collection also contains several fabric prints with a pink background – perfect for a baby girl. I have those in my stash! 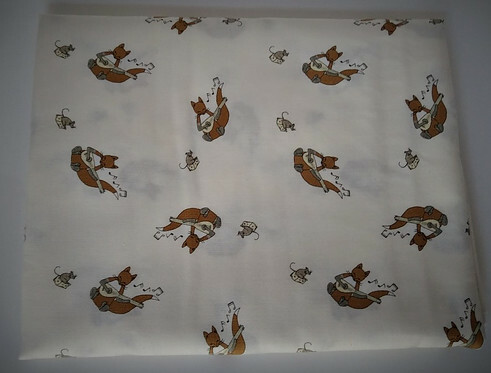 The fabric to be used for the backing is shown below and is from a 3-yard cut of print fabric from the same line. 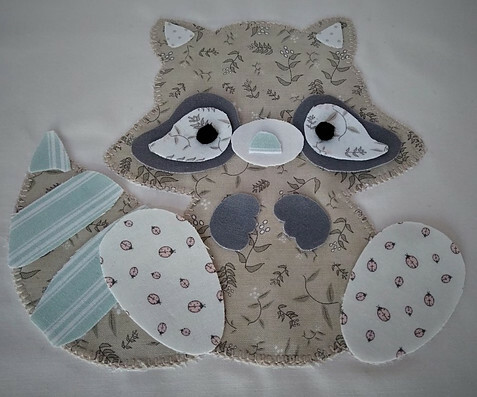 “Woodland Critters Baby Quilt” by Avery Lane. In addition to the applique design his pattern also features the Disappearing Four Patch design described in an earlier post. I’ll post images of that portion of the quilt top as they become available. 1) All six appliqued blocks finished and up on my design wall. 2) All fabric needed for the disappearing four patch pattern cut into squares and strips. 3) Pieced at least one row, giving a better idea of what the finished quilt will look like. Please leave any questions, comments or suggestions below! I am have the same mindset when I make a gift for someone, I also want it to be absolutely perfect. But sometimes it just doesn’t happen that way. I’ve learnt now to enjoy making the gift as much as the person enjoys receiving the gift. So far the little critters look adorable – I’m sure the finished product is going to look amazing and your friend will be thrilled! It’s not as hard as it looks – probably why I enjoy this type of craft. It looks way more difficult than it actually is! Sometimes I am like you where I want to do things perfectly. One of my downsides ~ because when I am like this, the project seems to take forever because I am constantly redoing or fixing something I think is not right. Am glad you took the leap of faith as you mentioned, I believe sometimes that is one of the hardest things to do! I believe your finished project will look just fine in the end! The way things were laid out in your pictures looked fine to me, I know I would not know any differently! Take care and have a blessed day! Keep the posts coming and don’t worry! It helps knowing there are others who run into the same obstacles yet find ways to overcome them! 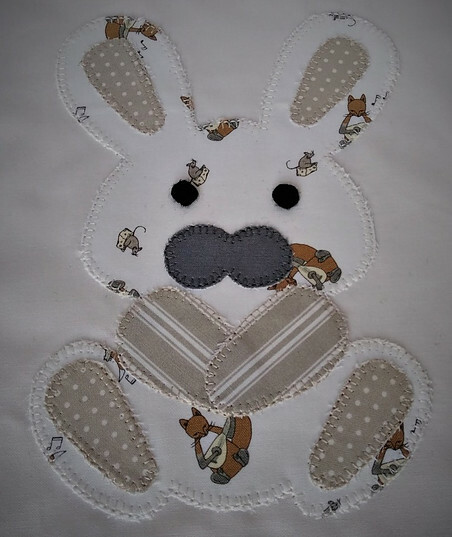 These patterns are adorable and I am going to try the rabbit first! I love home-made gifts and even though I am new to the whole applique process, I think this would be something I could handle. I’ve bookmarked your site for more great ideas! Yes this pattern from Avery Lane is so darn cute. When I saw it I knew I had to at least try it! I can’t wait to finish it and post the finished quilt!